A reward of £20,000 is being offered for the return of two HM Revenue and Customs CDs containing the personal details of 25 million people. It comes as the main searches end for the discs, lost after being sent from the HMRC to the National Audit Office. Meanwhile, the acting head of the HMRC said there had been seven incidents of "some significance" involving data security breaches since April 2005. These "may well" indicate systemic failure, David Hartnett added. Facing the Commons Treasury sub-committee, Mr Hartnett revealed that, among other incidents, the HMRC's IT partner had lost a disc containing banking information in 2006. This was later found. He said that all breaches are recorded, including such events as "leaving a cupboard door open overnight". HMRC said the breaches were already in the public domain and had been reported to the Information Commissioner. They include letters about tax credits being sent to the wrong addresses; confidential waste falling off the back of a lorry; records to a pension company about 15,000 people being lost; and a laptop containing sensitive information being stolen from a car in Liverpool. BBC political correspondent Guto Harri said Prime Minister Gordon Brown was reluctant to admit systemic failure but added that a review was already in place. Speaking about the recent loss of 25 million people's details, Mr Hartnett said morale among HMRC staff was now "very low indeed", but workers were "determined to learn from this". The two unencrypted CDs, containing the entire child benefit database, were posted from HMRC offices in Gateshead in October, but never arrived at the NAO in London. The prime minister and chancellor have apologised and an inquiry is under way, alongside the police investigation. Millions of families have been told to look out for fraudulent use of their details, which include children's names, addresses, dates of birth and National Insurance and bank details. 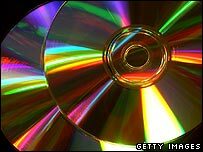 The HMRC sent letters last week to the seven million households whose records were on the discs, in which it said it expected the CDs were still on government property. But the update from the Metropolitan Police, leading the search, does not go so far, although it does say "to date there is no evidence that the lost data has ended up in criminal possession". The statement also reveals that the core team hunting the discs has been cut from 47 to 32. It sets out day-by-day the searches that have taken place of offices and computers and even a rubbish tip. The update on the progress of the search came as it was reported in the Daily Telegraph that the identities of up to 350 of people in witness protection programmes were contained on the CDs. Thursday 15 November: 2007 The Metropolitan Police Service was first informed of the loss and was asked to provide assistance to enquiries being led by HMRC. Sunday 18 November: Police investigation begins after handover from HMRC at 1430GMT. Searches of NAO started. Monday 19 November: Searches and enquiries at HMRC. Searches continue at NAO. Tuesday 20 November: Searches of NAO 157-197 Buckingham Palace Road. Searches of HMRC Waterview Park. Wednesday 21 November: Searches of HMRC Waterview Park re-commence. Enquiries made at DWP Long Benton, including forensic computer work on workstations. Thursday 22 November: Searches of HMRC Waterview Park continue. Friday 23 November: Searches and enquiries of HMRC Waterview Park continue. Further enquiries made and forensic computer work at DWP at Long Benton. Searches begin at TNT depot London City hub. Saturday 24 November: Searches of HMRC Waterview Park continue. Enquires continue TNT London City hub. Enquiries start at TNT Accrington hub. Sunday 25 November: Searches of HMRC Waterview Park continue. Enquiries and searches made HMRC Customs House. Monday 26 November: Enquiries continue HMRC Waterview Park. Search NAO post room Blackpool. Tuesday 27 November: Enquiries continue HMRC Waterview Park. Searches of TNT Durham hub. Searches at NAO - 157-197 Buckingham Palace Road. Wednesday 28 November: Enquiries HMRC Newcastle. Enquiries made TNT Cumbernauld. Computer examinations continue. Thursday 29 November: Computer examinations continue Enquiries made at waste disposal site at Rainham. Further enquiries with TNT, including searches of TNT - Lount. Friday 30 November: Enquiries made HMRC Newcastle. Enquiries with Royal Mail. Further computer work. Worried about lost DVLA records?